Fallingwater is the name of the summer house Frank Lloyd Wright designed in 1935 for the Kaufmann family. It is in the woods over a waterfall in Pennsylvania. It is a nationally listed national historic place, and some say it is the most famous private house in the world. Lua error in Module:Location_map at line 488: Unable to find the specified location map definition: "Module:Location map/data/Pennsylvania" does not exist. Fallingwater has strong horizontal and vertical lines. The house actually sits low in the valley over the stream, but looks dramatic from further downstream. It has large terraces, and some of them stick straight out and hang right over the waterfall or the stream. There are windows and glass doors, with only narrow steel supports between them, wrapping all the way around the living room. There are also windows going all the way from the floor to the ceiling in all three stories of the tower. Most of the house is made from stone. There are strong horizontal and vertical lines in the design of the house. It resembles the horizontal and vertical lines in the rock formations and other natural features. The waterfall can be heard everywhere in the house. Wright wanted there to be a close connection between inside and outside, and for the house itself to be natural. The large, cave-like living room has a big fireplace built on a large rock that comes up out of the floor. This was Edgar Kaufmann's favorite place to sit before the house was built. A stairway hangs down from the main floor to the stream. A glass hatchway lets people go down it from the living room. Some of the furniture is built right into the house. Many shelves are attached directly into the wall, sticking out without any supports that can be seen, like the floors and terraces of the house itself. There is a guest house on the hill behind the main house. It is connected by an "S" shaped, covered walk. There is a plunge pool beside the guest house. In 1991, members of the American Institute of Architects named the Fallingwater house the "best all-time work of American architecture". ↑ 1.0 1.1 1.2 "National Register Information System". National Register of Historic Places. National Park Service. 2010-07-09. ↑ "PHMC Historical Markers". Historical Marker Database. Pennsylvania Historical & Museum Commission. Retrieved December 20, 2013. ↑ 3.0 3.1 "Fallingwater". National Historic Landmark summary listing. National Park Service. Archived from the original on 2008-06-24. Retrieved 2008-07-02. Edgar Kaufmann Jr. 1986. Fallingwater: a Frank Lloyd Wright country house Abbeville Press. Robert McCarter 2002. Fallingwater aid. (Architecture in Detail) Phaidon Press. Franklin Toker 2005. Fallingwater rising: Frank Lloyd Wright, E.J. Kaufmann, and America's most extraordinary house. Knopf. Lynda S. Waggoner and the Western Pennsylvania Conservancy 1996. Fallingwater: Frank Lloyd Wright's romance with nature. Universe Publishing. 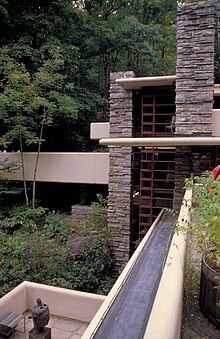 Wikimedia Commons has media related to Fallingwater. Fallingwater pictures: fall photo - numerous excellent photos of the house.